^ 美国前总统胡佛与中国开平煤矿. 人民政协报. 2013-01-24 [2016-03-25]. ^ 4.0 4.1 Herbert Hoover: Chronology 互联网档案馆的存檔，存档日期2006-12-05., Herbert Hoover Presidential Library and Museum, Accessed November 30, 2006. ^ 5.0 5.1 Dave Revsine, One-sided numbers dominate Saturday's rivalry games, ESPN.com, November 30, 2006. ^ U.S. NARA, "Hoover Online". 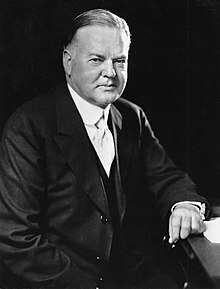 Biographical Sketch of Herbert Hoover, Stanford. [2008-10-06]. （原始内容存档于2008-10-07） （英语）. ^ 7.0 7.1 Gwalia Historic Site. ^ Australian Broadcasting Corporation, 2005, "Hoover's Gold" (PDF). [2009-09-25]. （原始内容 (PDF)存档于2009-03-26）. ^ Cue heritage trail 互联网档案馆的存檔，存档日期2003-03-16. ^ The Engineer President. （原始内容存档于2009-05-13）. ^ Hoover, Herbert C. Principles of Mining First. London: McGraw-Hill Book Company. 1909 [2008-09-25] （英语）. ^ Team, Farlang. De Re Metallica full text & illustrated. Agricola. Hoover.. Farlang. ^ THE CABINET: Good-Times Charlie. 1950年1月30日 –通过content.time.com. ^ Whisenhunt, Donald W. Poetry of the People: Poems to the President, 1929-1945. Popular Press. 1996年3月20日 –通过Google Books. ^ Peter D. Norton, Fighting Traffic: The Dawn of the Motor Age in the American City (MIT Press, 2008), 178-197 ISBN 978-0-262-14100-0. ^ Barry, John M. Rising Tide: The Great Mississippi Flood of 1927 and How It Changed America. 纽约: Simon & Schuster. 1998. ISBN 0-684-84002-2 （英语）. ^ Baughman. American Decades. 1920-1929. 密歇根: Gale Research. 1996: 52, 197, 201, 203–204, 215, 217, 368, 380 （英语）. ^ Hoover, Herbert. American Individualism. 1922. ^ Hoover, Herbert (1952). The Memoirs of Herbert Hoover. ^ The Conscience of a Liberal. 2019年2月24日 –通过Wikipedia. ^ Krugman, Paul. Opinion | Paul Krugman: Fifty Herbert Hoovers. 2008年12月28日 –通过NYTimes.com. ^ Robert Reich Interview 存档副本. [2009-09-28]. （原始内容存档于2010-02-26）. ^ "Smoot-Hawley Tariff" 互联网档案馆的存檔，存档日期2009-03-12., 美国国务院. ^ "Reconstruction Finance Corporation" 互联网档案馆的存檔，存档日期2013-10-29., EH.net Encyclopedia. ^ "What Caused the Great Depression of the 1930's" 互联网档案馆的存檔，存档日期2008-11-30., Shambhala.com. ^ "Great Depression in the United States" 互联网档案馆的存檔，存档日期2009-03-01., 微软百科. ^ Lekachman, Robert (1966). The age of Keynes. Random House. p. 114. ^ Friedrich, Otto (February 1, 1982). "F.D.R. 's Disputed Legacy". TIME Magazine. ^ 52.0 52.1 Gibbs, Nancy. When New President Meets Old, It's Not Always Pretty. 时代杂志. November 10, 2008 （英语）. ^ 胡佛这里谈到的兼并是指美国财长亨利·摩根索于二战临结束之际提出的分割德国计划。根据这一计划，德国主体将被分割成南北两个国家，而如鲁尔等重要矿区和工业区将或被其他邻国兼并，或成为国际共管地带。此计划的一个重要目的是对德国去工业化，使之成为所谓“田园国家”（pastoral state）。原文：“There is the illusion that the New Germany left after the annexations can be reduced to a 'pastoral state'. It cannot be done unless we exterminate or move 25,000,000 people out of it.” The Marshall Plan at 60: The General’s Successful War On Poverty 互联网档案馆的存檔，存档日期2009-04-19. Myers, William Starr and Walter H. Newton, eds. The Hoover Administration; a documented narrative. 1936. Hoover, Herbert C. Memoirs. New York, 1951–52. 3 vol; v. 1. Years of adventure, 1874–1920; v. 2. The Cabinet and the Presidency, 1920–1933; v. 3. The Great Depression, 1929–1941. Dwight M. Miller and Timothy Walch, eds; Herbert Hoover and Franklin D. Roosevelt: A Documentary History. Greenwood Press. 1998. Bornet, Vaughn Davis, An Uncommon President. In: Herbert Hoover Reassessed. (1981), pp. 71–88. Burner, David. Herbert Hoover: A Public Life. (1979). one-volume scholarly biography. Gelfand, Lawrence E. ed., Herbert Hoover: The Great War and Its Aftermath, 1914-1923 (1979). Hatfield, Mark. ed. Herbert Hoover Reassessed (2002). Hawley, Ellis. Herbert Hoover as Secretary of Commerce: Studies in New Era Thought and Practice (1981). A major reinterpretation. Hawley, Ellis. Herbert Hoover and the Historians (1989). Lloyd, Craig. Aggressive Introvert: A Study of Herbert Hoover and Public Relations Management, 1912-1932 (1973). Nash, George H. The Life of Herbert Hoover: The Engineer 1874-1914 (1983), the definitive scholarly biography. Life of Herbert Hoover: The Humanitarian, 1914-1917 (1988), vol. 2. Nash, Lee, ed. Understanding Herbert Hoover: Ten Perspectives (1987). Smith, Gene. The Shattered Dream: Herbert Hoover and the Great Depression (1970). Wert, Hal Elliott. Hoover, The Fishing President: Portrait of the Private Man and his Life Outdoors (2005). ISBN 978-0-8117-0099-3. Long annotated bibliography via University of Virginia. Barber, William J. From New Era to New Deal: Herbert Hoover, the Economists, and American Economic Policy, 1921-1933. (1985). Barry, John M. Rising Tide: The Great Mississippi Flood of 1927 and How It Changed America (1998), Hoover played a major role. Calder, James D. The Origins and Development of Federal Crime Control Policy: Herbert Hoover's Initiatives Praeger, 1993. Carcasson, Martin. "Herbert Hoover and the Presidential Campaign of 1932: the Failure of Apologia" Presidential Studies Quarterly 1998 28(2): 349-365. Clements, Kendrick A. Hoover, Conservation, and Consumerism: Engineering the Good Life. U. Press of Kansas, 2000. DeConde, Alexander. Herbert Hoover's Latin American Policy. (1951). Dodge, Mark M., ed. Herbert Hoover and the Historians. (1989). Fausold, Martin L. The Presidency of Herbert C. Hoover. (1985) standard scholarly overview. Fausold Martin L. and George Mazuzan, eds. The Hoover Presidency: A Reappraisal (1974). Ferrell, Robert H. American Diplomacy in the Great Depression: Hoover-Stimson Foreign Policy, 1929-1933. (1957). Goodman, Mark and Gring, Mark. "The Ideological Fight over Creation of the Federal Radio Commission in 1927" Journalism History 2000 26(3): 117-124. Hamilton, David E. From New Day to New Deal: American Farm Policy from Hoover to Roosevelt, 1928-1933. (1991). Hart, David M. "Herbert Hoover's Last Laugh: the Enduring Significance of the 'Associative State' in the United States." Journal of Policy History 1998 10(4): 419-444. Hawley, Ellis. "Herbert Hoover, the Commerce Secretariat, and the Vision of an 'Associative State,' 1921-1928." Journal of American History 61 (1974): 116-140. Lichtman, Allan J. Prejudice and the Old Politics: The Presidential Election of 1928 (1979). Lisio, Donald J. The President and Protest: Hoover, MacArthur, and the Bonus Riot, 2d ed. (1994). Olson, James S. Herbert Hoover and the Reconstruction Finance Corporation, 1931-1933 (1977). Robinson, Edgar Eugene and Vaughn Davis Bornet. 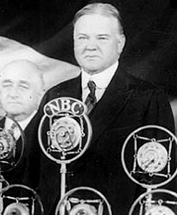 Herbert Hoover: President of the United States. (1976). Romasco, Albert U. The Poverty of Abundance: Hoover, the Nation, the Depression (1965). Schwarz, Jordan A. The Interregnum of Despair: Hoover, Congress, and the Depression. (1970). Hostile to Hoover. Stoff, Michael B. "Herbert Hoover: 1929-1933." The American Presidency: The Authoritative Reference. New York, New York: Houghton Mifflin Company (2004), 332-343. Sobel, Robert Herbert Hoover and the Onset of the Great Depression 1929-1930 (1975). Tracey, Kathleen. Herbert Hoover—A Bibliography. His Writings and Addresses (1977). Wilbur, Ray Lyman, and Arthur Mastick Hyde. The Hoover Policies. (1937). In depth description of his administration by two cabinet members. Wueschner, Silvano A. Charting Twentieth-Century Monetary Policy: Herbert Hoover and Benjamin Strong, 1917-1927. Greenwood, 1999.